Maryology has been pretty Mary-free lately (other than me, of course) but there can be no better occasion to Mary-up than today. December 12 is the Feast Day of Our Lady of Guadalupe – and on Sunday we remember Mary-the-about-to-be-mother-of-Jesus’ reaction to being told she was pregnant. What I love about these two visions of Mary is how bold she is. Most of the time, Mary is a quiet statue or painting humbly gazing at the ground. But how did she react at probably the most overwhelming moment of her life? She burst into song! How did she reveal herself to Juan Diego? With out-of-season flowers that made an ornate portrait of her on his cloak. I’m telling you, this woman is no wallflower. She is flamboyantly faithful and ostentatiously gracious. Which saint appears on more tattoos than Mary? None. 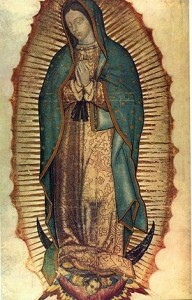 Today, I induct the Virgin of Guadalupe into the Hall of Marys. She’ll be there with Mary of Nazareth, which might be confusing for mere mortals, but I think they will figure it out. Our Lady of Guadalupe has her own amazing place in the life and culture of Mexico and the American Southwest – she is a cultural and religious unifier and, to some, a feminist symbol of power. She is simultaneously plain and radiant, simple and complex, gentle and strong. She’s not gazing at the ground, she is standing on the moon looking at you. Ave. This entry was posted in Advent, Hall of Marys, Uncategorized and tagged Hall of Marys, Mary by Mary Keenan. Bookmark the permalink.